The Purair BIO Class II, Type A2 Biological Safety Cabinets (BSCs) provide a primary containment work area for life science research, cell culture processing, and other applications where protection of the user, the work product, and the environment, and mitigation of cross-contamination on the work surface are needed. 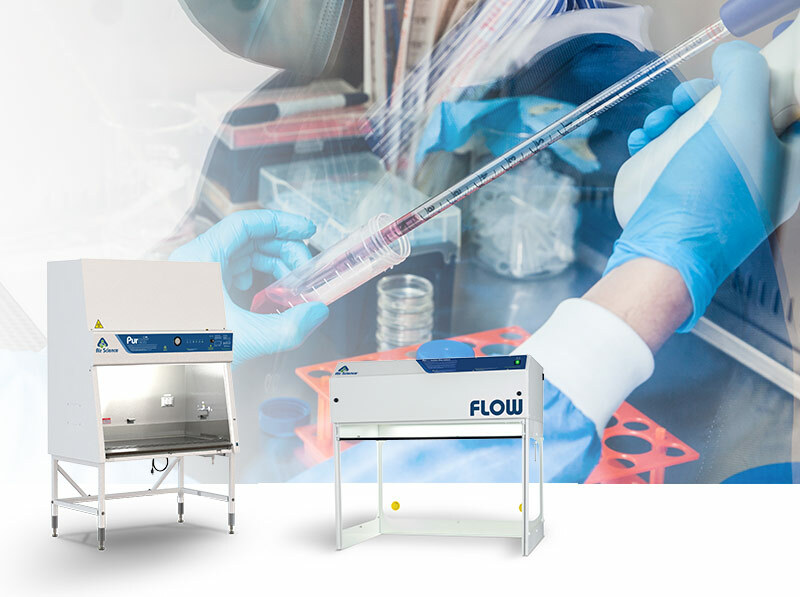 The Purair® BIO biological safety cabinet (BSC) is certified for safety and performance in accordance with NSF/ANSI Standard 49 and EN12469 which certifies Class II, Type A2 laminar flow cabinets are suitable for working with biosafety agents at levels 1, 2, 3, and 4. Air Science 4-foot models are certified by NSF. Single EC Blower Motor Design. The Purair BIO is designed with a single EC blower motor for ease of use, reliability, and to promote low cost of ownership. Dual motor designs can introduce a number of problems, including unbalanced airflow, higher maintenance costs, longer certification processes, and uneven filter loading. Airflow adjustments are simpler, operational costs lower, and maintenance easier for BSCs equipped with single EC blower motors. Flexibility. The Purair BIO includes multiple service connections for maximum flexibility. It includes duplex electrical outlets with splash-proof, UL listed covers. CSA certified service valves for gas, air, and vacuum are also available. Maximum working pressure of 75PSI. Operator Safety. The anti-ultraviolet, 6 mm tempered glass ensures maximum protection for the operator. Ergonomic Design. The user interface combines ergonomics, safety, and aesthetics with a 10° angled window design that reduces operator head and elbow discomfort, as well as eye strain and fatigue. Note: NSF Certification applies to the biological safety cabinet models AHA-133-AA-B (Air Science Model (AS-AHA-133-AA-B), AHA-133-AB-B (Air Science Model AS-AHA-133-AB-B), and AHA-133-CB-B (Air Science Model AS-AHA-133-CB-B), as well as AHA-133-AC-B (Air Science Model AS-AHA-133-AC-B), AHA-133-CA-B (Air Science Model AS-AHA-133-CA-B), and AHA-133-CC-B (Air Science Model ASAHA-133-CC-B) manufactured by Chung Fu Technical Development Co. Ltd., Taipei, Taiwan, and marketed by Air Science, LLC, USA. Click on the products listed here to learn more about each of our units or use our online quote request form to receive a customized quote for your application. Contact a sales representative by visiting our Sales Page. 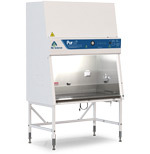 Vertical and horizontal clean benches are not the same as biological safety cabinets. Learn more about the common performance attributes and differences that separate clean benches from the NSF Class II, Type A2 criteria. We build custom enclosures for specific customer requirements and applications. Each unit is designed to maximize operator safety and accessibility, and is tested and certified to factory specifications and industry standards.